Can you call fire nature? Is it fair to say that nature is kicking our collective human asses? 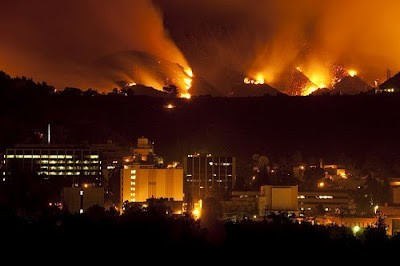 Tonight, the fire continues to blaze behind the hills, behind my safe and quiet, tree-lined neighborhood. It’s drapes like a big scary necklace around the hills. There have been no whisperings from neighbors to evacuate, but — just in case — I filled my biggest Europe-Israel suitcase with things Lucy and I might need. Jeans. Sneakers. Dog food. Jewelry from people I love. And then the odd things that somehow wound up in there — a green batik sarong I got in Thailand 18 years ago, but have not worn since. An antique belt buckle from my mother that I’m sure I will have no use for, ever. An accordion file of receipts my accountant wants me to keep. I went through cupboards and realized I can buy towels. New contacts. Makeup. Skip, skip, skip. But there are so many paintings. If I had to make a choice, would it be my grandmother’s, my mother’s, or my original Peter Maxes? I don’t know. I don’t want to get into what photos and diaries and art would be salvaged. I can’t wrap my head around it all. I have a feeling that when it comes down to it, in all the panic and the shock, the things you think you’ll take are rarely the things you’ll actually take. Except the dog. That’s a given.